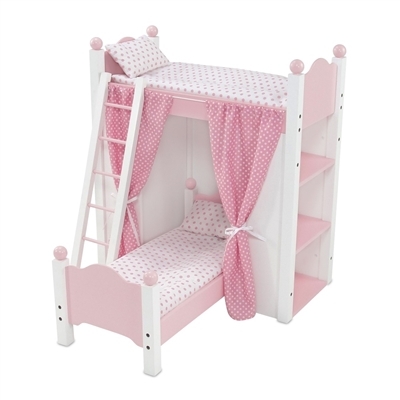 This amazing pink and white bunk bed combo piece comes with tons of features and is perfectly sized for your 18" doll's bedroom! 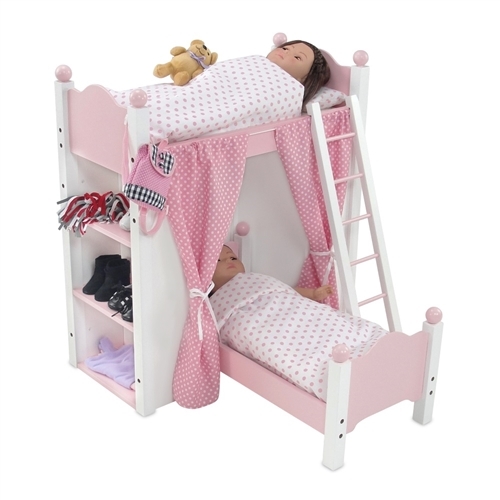 This unique piece provides your doll a loft bed with shelving units on either side for loads of extra storage space, plus ladder and a separate bottom bed to angle under the loft space. Both beds come with pretty pink and white polka dot blankets, thick matching pillows and a white comfy mattress. An ultra cool feature of this set is that you can even remove the bottom bed and use the extra space below the top bunk for storage, closing the beautiful curtains to neatly tuck things away, and when the bottom bed is behind the curtains, it makes for a perfect snuggly place to sleep! Save space with this all-in-one piece! This sturdy and versatile pink and white wood doll bed includes loft bed with ladder and shelving units on both sides for storing doll clothes and accessories, plus a separate single bed. Lovely furniture piece comes with 2 sets of pretty pink polka dot bedding, including comforter, mattress and pillow, and a set of coordinating polka dot curtains to add a touch of class! Doll furniture piece measures 21.75" x 21.75" x 23.5" when fully assembled. Wooden doll furniture made to fit 18-inch dolls such as American Girl ®, Madame Alexander, Gotz, Journey Girl, Our Generation, etc. Dolls, doll clothing and doll accessories are not included.